A workhouse existed at Uttoxeter from around 1728 (Hitchcock, 1985). A parliamentary report of 1777 recorded parish workhouses in operation at Abbots Bromley (for up to 30 inmates) and Leigh (30 inmates). A workhouse was erected in 1788 at the north side of Holly Road to the north-west of Uttoxeter. County of Stafford: Abbots Bromley (2), Bromshall, Croxden, Draycote in the Clay, Gratwick, Kingston, Leigh (2), Marchington, Marchington Woodlands, Newborough, Rocester (2), Uttoxeter (4). County of Derby: Boylstone, Doveridge, Somersall Herbert, Sudbury. The population falling within the Union at the 1831 census had been 12,837 ranging in size from Bromshall (population 116) to Uttoxeter itself (4,864). The average annual poor-rate expenditure for the period 1834-36 had been £4,112 or 6s.5d. per head of the population. A new Uttoxeter Union workhouse was erected in 1838-40 on the site of the old workhouse on Holly Road. It cost £3,900 and could accommodate 200 inmates. It was designed by the partnership of George Gilbert Scott and William Bonython Moffatt who were the architects of a large number of workhouses including those at Burton-upon-Trent, Lichfield and Uttoxeter. 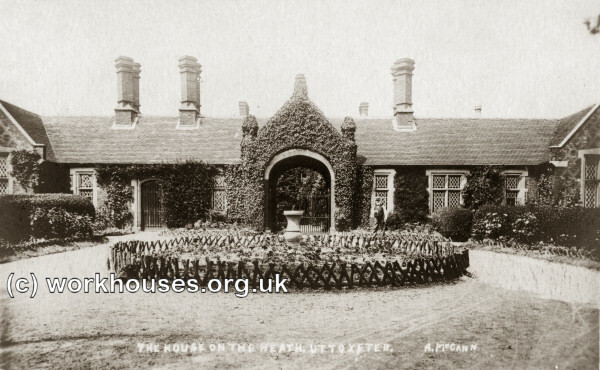 Uttoxeter workhouse entrance block from the south-east, early 1900s. None of the workhouse buildings survive. Staffordshire Record Office, Eastgate Street, Stafford, ST16 2LZ. Guardians' minute books (1847-1930); Ledgers (1879-1918); etc.